"What happens to you?" you might be asking. Well let's just say that sometimes I bust out a project too fast and too impatiently to take pictures, document, or write down how I even did it. You guys are in luck though. Again, I know you are curiously asking, "Why am I in luck?". Well you see you are in luck because the first one I made...the one pictured above...yup that one was...um...a little snug. "It doesn't look that snug in the picture?" My, my you have a lot of questions today. First thank you for saying it doesn't look too snug. Second, well I didn't take any picture of my fanny now did I. My ghetto-tastic booty would be the culprit of the too snug skirt. Who knew I was channeling my JLo. So basically this was a longer and slightly more embarrassing way of saying that you get a tutorial on how to make my T-shirt Pencil Skirt because I had to make myself another one. One less emphasizing of my backside. Silver lining is that now I have a tutorial to share with you. Whew...enough talk of well my you-know-what. On to the tutorial for my new better fitting T-shirt Pencil Skirt. 1 Men's T-shirt, without a pocket...I recommend the biggest size you can find. That way you have the most fabric. 1. 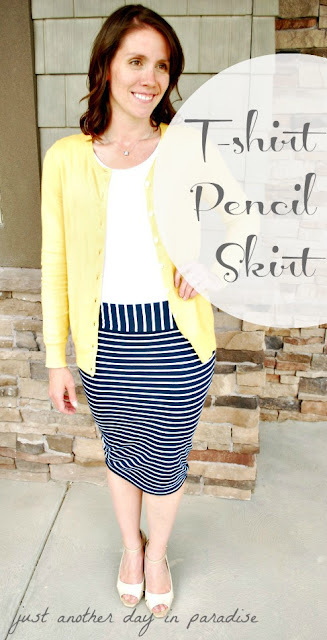 Make a pattern for your skirt. You can either outline an existing skirt, or you can do what I did and I outlined my self...yes I did. I laid down on the freezer paper and traced from where I wanted it to hit on the waist to below my knees. I added 1/2" on each side (the 2nd time that is...hehehe) to allow for the seam. I made sure to have the skirt taper for the pencil skirt effect. Make sure not to have it taper so much though that you won't have the give to actually walk in the skirt once it is made. I adjusted the tracing on the freezer paper to make it symmetrical. Lay the pattern over the t-shirt. 2. Iron the pattern (freezer paper) onto the shirt to stabilize it. 3. Cut out. Start by cutting the top layer and then going back and cut the back layer (front and back of the shirt). 4. Save the side seams scraps of the shirt. 5. You will have two pieces. These will be the top bands of your skirt. 6. Layer them, folded edge at the top. Lay them at the top of your skirt pieces. Cut the two strips a little bigger than the width of the top of the skirt. 7. Now to make the waist bands the same height (top to bottom), layer them on top of each other with the folded sides flush with each other. Cut off the excess of the raw edges to make them equal. Mine ended up being between 3-4 inches. 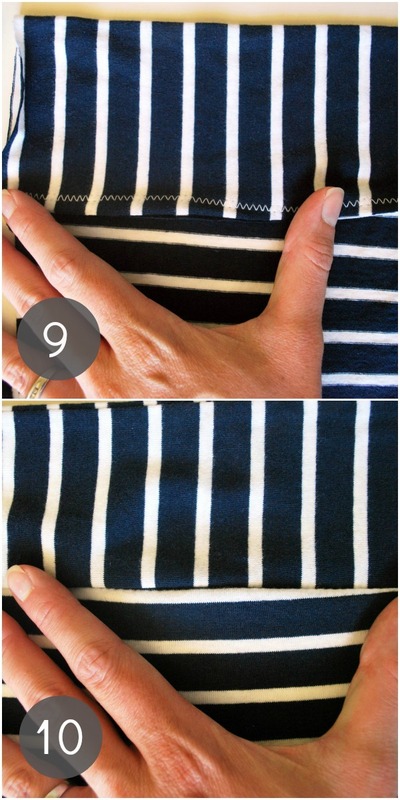 Your band width could vary depending how much excess you have from the shirt. You should end up with two band pieces. 8. Pin each band strip to one piece of the skirt. Pin right sides facing with the raw edges on top. 9. Sew them together with a serger if you are one lucky dog and have one...I will try not to hate you. Otherwise, just sew with a zig zag stitch on your regular machine. 10. 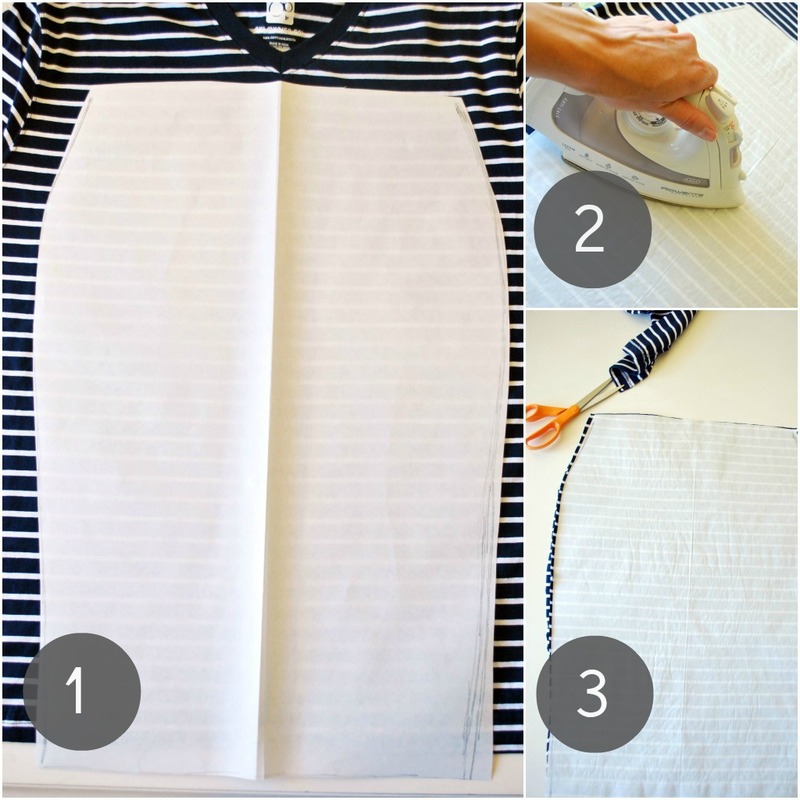 Fold up the band and press with an iron. 11. With the band attached to the skirt pieces, lay each new skirt piece on top of each other, right sides facing. Pin. By now the freezer paper should not be on the fabric. You will probably need some patience here. If your shirt is like mine, it will roll a little. Just take a deep breath and think about how cute you are going to look. 12. 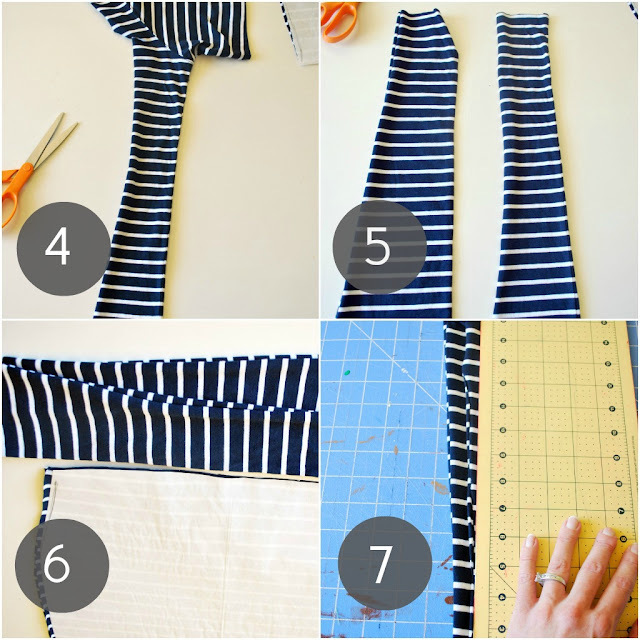 Sew from top to bottom with a serger...eh hem...still not jealous...or zig zag it. I made sure to back stitch at both ends. 13. Now simply turn your skirt out. Since you used the bottom of the shirt for the bottom of your skirt you don't need to sew a hem. Isn't it glorious when part of the job is already done for you. Now shimmy yourself into it and make your husband, boyfriend, or potential boyfriend/husband take you to dinner. Oh, I'm so excited to try this one! I'll be on the lookout for a shirt! Also possibly considering stealing one of hubbys old band shirts. Thanks for the tutorial!! This looks so good! super impressed and posting this on our pinterest.